First of all, we understand the definition of chaining in Java. The definition of Chaining in Java is " a set of links which connect one constructor to another constructor". Thus, we can define Constructor chaining as "Constructor chaining in Java is a technique of calling one constructor from another constructor using "this()" and "Super()" keyword". When you will use constructor chaining, it is important to understand the order in which the constructor will execute. The constructor chain is followed until it reaches the last chained constructor and the end of the chain will always be object's class constructor because of the inheriting every class from the object class by default. 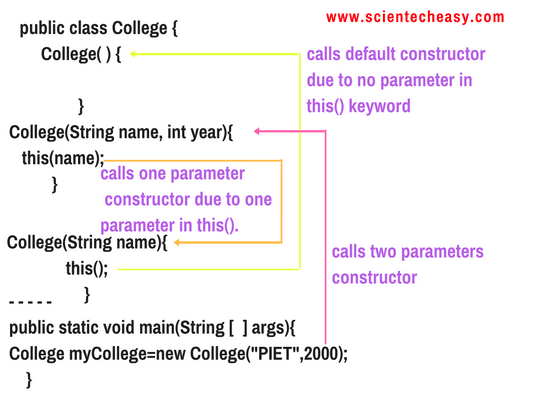 Now see the below figure which shows that a class College with three constructors in which first we called the two parameter constructor after that one parameter constructor called using this(parameters) keyword and then called the default constructor. That's the order of execution. You can also change the order as you like. Therefore, it is important to understand the order of execution of the constructor that which constructor has to execute first and last? You cannot call the constructor directly by name because it is illegal in Java. Why do we use/need Constructor chaining in Java? In Java, Constructor chaining is used where you want to perform multiple tasks in a separate constructor for each task and make their order by chaining which makes the program more readable and easy to understand for everyone. You can provide as many as constructors as you want in your classes and use constructor chaining to set the link among them. How to call one Constructor from another constructor? 1. Using this() keyword to call the current class constructor within "same class". 2. Using super() keyword to call the Super class constructor from the "base class". The statement this(parameters) invokes the same class constructor with parameters which must match. this(); ➨ To call default current class constructor. this("name"); ➨ To call one parameter current class constructor with String argument. this("shubh", 24) ➨ To call two parameters current class constructor with String and int argument. 1. You must use the this () keyword to call the current class constructor because JVM never puts automatically this() keyword like a super() keyword. 2. this() keyword must be in the first line of the constructor to call the same class constructor or current class otherwise you will get this error message: Exception in thread "main" java.lang.Error: Unresolved compilation problem: Constructor call must be the first statement in the constructor. 3. There must be at least one constructor without this keyword. 4. Constructor chaining can be done in any order. Let's see a very simple example program step by step. Output: Java was developed by James Gosling at Sun Microsystem and released in 1995 James Gosling is known as Father of Java programming language. The Java compiler is written in Java but Java runtime in ANSI C.
Let's take one more example program related to this. 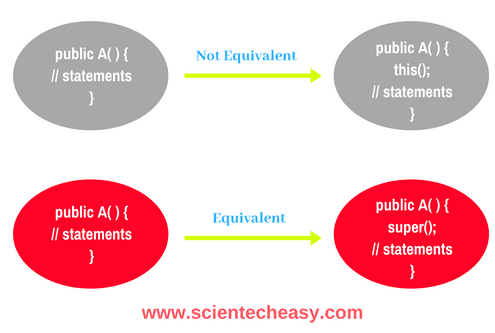 The statement super() calls the no-argument constructor of its superclass and the super(argument) invokes the superclass constructor where argument must match. super(); ➨ To call the default superclass constructor. super(24); ➨ To call the superclass constructor with one int parameter. 1. You must use the super() keyword to call the superclass constructor but if you do not put a super keyword, JVM will put automatically the super() keyword. 2. super() keyword must be in the first line of the constructor. Calling a superclass constructor' name in a subclass causes a syntax error. 3. A constructor is used to create the object of the class. Unlike properties and method, the constructor of the superclass is not inherited in the subclass. They can only be called from the subclass constructor using the super keyword. Let's take one simple example program to understand all the points. Hope that this tutorial has covered almost all the important points related to Constructor Chaining in Java with an Example program in an easy way and step by step. We hope that you will have enjoyed this tutorial.